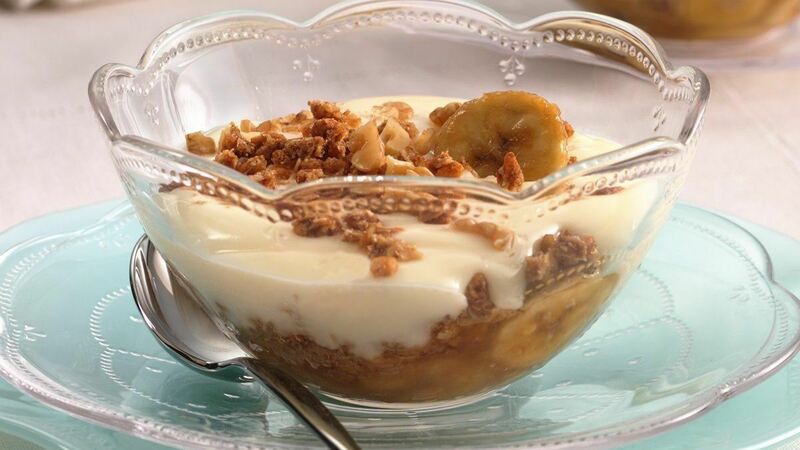 For each serving, spoon about 1/3 cup remaining banana mixture into each 10-oz dessert bowl. Leaving granola bars in wrappers, break apart into granola-like pieces; reserve 2 tbsp granola for garnish. Sprinkle remaining chopped granola over banana mixture, dividing evenly. Spoon 1/2 cup yogurt over granola. Garnish each serving with 1 teaspoon walnuts, 2 teaspoons chopped granola and 1 reserved banana slice. Serve immediately.